The survival uses for horses are abundant. After the SHTF and the power grid ultimately fails, the hooved beauties will once again be the primary mode of transportation in the United States of America. Caring for and training a horse is a massive commitment and requires factoring their needs into you prepping budget – but the payoff will be more than worth the bother and spent pennies! No matter the type of doomsday disaster you are prepping for, the basic needs all remain the same – and a horse will be worth its weight in gold when the SHTF. Horses do not need conventional fuel to get you where you need to go in a hurry. All that grass you won’t be able to cut when a TEOTWAKI scenario happens will gladly be consumed by your herd of horses, mules, and donkeys – all of which boast distinct survival value. The best bugout vehicles are rugged, durable, and designed for off-road use – a horse fits the bill perfectly. Although some breeds are more geared than others to mountain riding and jumping, all breeds can be trained to traverse ground they become familiar with over time. Typically, a horse can run between 25 and 30 miles an hour when in peak condition. The current world record race horse speed is just a little faster than 43 miles-per-hour. Quarter horses are not usually as fast as gaited horses – and give a far bumpier ride, but they too will get you just about anywhere quickly. There are five common horse gaits, or ways in which a horse moves – walking, backing, trotting, cantering, and galloping. A relatively young and healthy horse can run at a full gallop for about three miles before nearing exhaustion. A horse can usually trot (jog) for 15 miles before needing to slow down to a walking speak or take a break. On average, you could expect to travel about 50 miles in a single day on horseback if the horse is not overloaded with gear. If your bugout plan involves hiking through the woods to reach safety, a horse can still be a worthwhile purchase. You could lead a pack horse to allow the transportation of more gear, or saddle up horses to carry children, the elderly, or disabled individuals who wouldn’t be able to make the trek on foot. Any time you can travel covertly and avoid being near a road or residential area, the odds of actually reaching your survival retreat likely increase. Horses can ride into the backcountry and heavy brush without difficulty. They will not outrun marauding hordes determined to steel your stuff – and maybe take your life on typical off-road terrain, but if horse and rider are both well-trained, they can escape into steep, narrow, or rocky areas where ATVs cannot go. Packhorses were among the earliest type of domesticate horses. They hauled goods during the Middle Ages on their backs and in wagons long distances to get to and from the marketplace. Horses have the ability to pack about 20 percent of their body weight. They weigh on average between 840 to 2,200 pounds. Doing a little quick math, that means a small horse could carry 168 pounds of survival supplies and a large horse could pack about 440 pounds of prepping gear. A donkey can carry even more weight than a horse due to its muscle structure. Average sized mules have been known to carry between 150 and 190 pounds for about 15 miles before needing a rest. When bugging out, one horse can be ridden to safety and another, or a donkey or mule, could be adorned with a back saddle and tasked with carrying the heavy weight. The daily use of a pack animal around the survival retreat cannot be over-appreciated. Training a single horse or multiple equines “to cart” – pull a cart, will easily replace the pickup truck or other mechanical device you would use pre-SHTF to complete the necessary chores on the homestead. Donkeys, horses, and mules can all naturally take to carting – but the phrase, “stubborn as a mule” was coined or a reason. Mules require both patience and determination to get through the training process. A pack saddle can also be used to carry heavy loads of firewood, harvested crops, hay, and weapons. A pack saddle, when safely placed on top of a saddle blanket to protect the back of the equine, evenly distributes the weight burden. The underside of a sack paddle conforms to the back of the horse or pack animal to further help prevent any back injuries when carrying heavy loads. Pack saddles hang on either side of the horse – with a gap in between where a rider would sit, to provide to the ventilation of sweat and to protect the animal’s backbone. The design of pack saddles has changed very little, if at all, since America’s pioneering days. It has a wood tree (base) a breeching piece to prevent the saddle from sliding too far onto the horse’ neck when walking with it fully loaded, a breast trap to prevent slippage onto the back end of the horse, and sturdy canvas bags (panniers) to hold the supplies being transported. There are three primary types of pack saddles. The army version of pack saddles have to strong metal hooks that hang off of each side to either bags/packs or crate can be carried by the horse. The Decker style pack saddle includes two rings so sling ropes for towing can be used to help move supplies, goods, or even an injured human on a litter, from place to place. The cross buck type pack saddle is probably the most popular and common style still use in great frequency. It has two wood bars attached to the wood tree to attach sling rope and bags on either side. 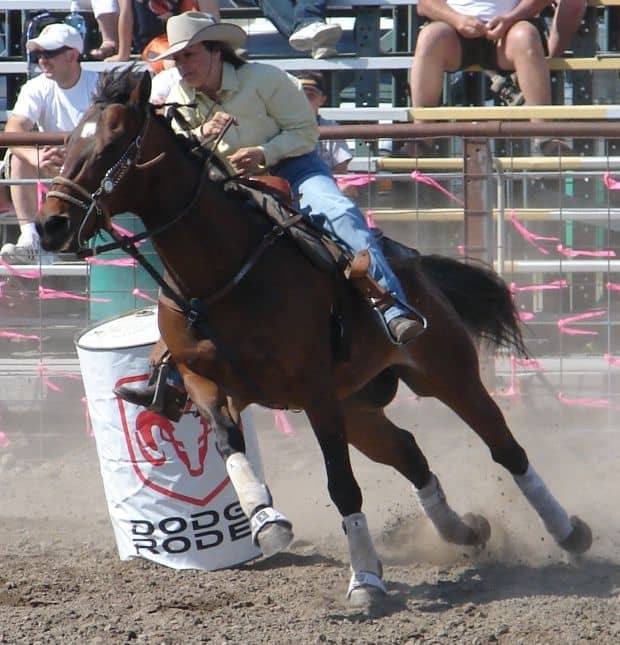 Quarter horses are docile by nature and are known to be easy to train. They are both sure-footed and boat a level-headed personality – even the mares, when compared to other breeds. American Quarter Horses are not gaited, so they give a bumpy ride, something a rider used to being saddled up on a gaited horse, will point out about three minutes into a ride on level ground. They boast incredible endurance when walking or trotting for substantial distance. Quarter Horses typically can lope (steady light run) for several miles without getting winded enough to need a rest. Because of their stout build, they make excellent pack horse. Even when they have a reduced food source, Quarter Horses are able to maintain both their body fat and muscle tone. This breed of horse has long been the top choice for ranchers due to their innate cattle cutting abilities. They can stop quickly and on command and have no problem keeping a cow cornered and still while it is being tended to by the rancher. All horses should be shod to protect their hooves when being ridden or driven on pavement or rocky ground. Quarter Horse in particular tend to suffer from stone bruises, chips, and cracks to their hooves. Have them shod regularly, especially when being used as a farm work or pack horse, use thick shoes for added protection, it will not slow them down a noticeable amount. You just will not find a horse more eager and adept at traversing steep terrain than Rocky Mountain and Tennessee Walkers. These gaited equines seem like they can just be ridden forever without tiring. One prepping article I read once about horse are survival “gear” rattled on about the many virtues of these horse, but then added they are not fast enough to help you escape danger in a hurry. The author of that piece must never have actually ridden a Rocky of Walker to make such a statement. Perhaps they just grow them different outside of Appalachia, but I have never seen a slow Tennessee Walker or a Rocky Mountain horse in my entire life – we are talking thousands of horse views here, folks. Just months ago, I witnessed a guy on the back of a Walker that ran so fast the cigarette in his mouth broke backwards and in half! Walkers are a little bit more broad and heavy than Rockies, so they may be able to carry more weight when used as a pack horse. Either type of horse will give you a smooth ride and pack your precious preps with great care. Mustangs are amazing and majestic creatures. They are perhaps the fasted and most steady horse on the planet. You get a seamless blend of both durability and endurance with a mustang. 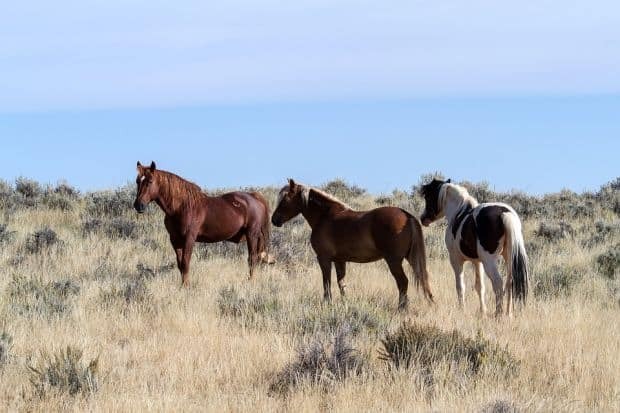 Wild mustang are beautiful and impressive, and can be purchased cheap after roundups to reduce the free-ranging population in the Wet. But, and it’s a big but, wild mustangs are notoriously difficult to train. Working with and riding wild mustang is definitely not for a novice rider. Mustangs can live and remain strong on very little feed. They have sturdy hooves that are not prone to cracking and are highly regarded in the horse world for their stamina. Belgians are the most common farm work horse in the United States. You really can’t ride them, at least most people can’t, due to their massive girth, but they will pull an extremely heavy wagon and pack a massive amount of weight on their backs. The breed has long been used by loggers to lug heavy timber out of the woods, regardless of the surrounding terrain. 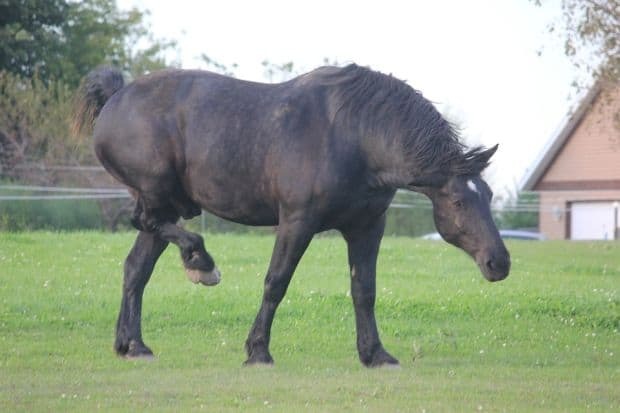 The stocky horses measure 16 to 17 hands tall on average and weigh about one tone. They are easy to both train and keep, but need to be shod regularly to prevent hoof damage due to the heavy loads they transport for their owners. Clydesdale horses are strong gentle giants. We have all witnessed their power during Budweiser commercials. They were initially bred as war horses. The breed is known for its intelligence and quick-learning ability during training. Unlike the larger Belgian draft horse breed, Clydesdales are not too large to be ridden as well as driven. Typically, Clydesdales range in size from 16 to 18 hands – about six feet tall. They are huge, yet extremely agile considering their size. These horses have even been used in equine jumping competitions, a true testament to their agility and versatility. They are not quick, but are sure-footed and can haul or pack a whole lot of weight. This breed is yet another sturdy and reliable work horse for use on a farm, ranch, or survival retreat. They too have been used in the logging industry and to pull plows and wagon. They can be ridden as a pleasure or trail horse as well. Percherons will stay on the trail as long as you are willing to sit the saddle, but they are not known for their speed. The breed originated in France and were initially seen as a food source. This breed of equine typically ranges in size from 15 to 17 hand and weighs approximately 2,000 pounds. They have thick and durable hooves and have been known to do farm work without the needs of shoes. Even novice riders should be able to handle a Percheron. They possess a sweet disposition typically and often love the attention of children. The breed is highly regarded for its healthy disposition, and is known as an easy-keeper. Percherons have competed successfully in races, jumping, and farm work contests for generations. These large and sweet horses bridge the gap between a typical pleasure horse and a stout drat horse. They will hit the trail and rides for mile after mile for pleasure and still be ready to wake the following morning and pack or plow the farm. Haflingers are known for both their docile manner and their intelligence. The breed is sturdy, sound, and always seems eager to please. Haflingers have successfully competed in jumping, race, far work, and endurance contests. 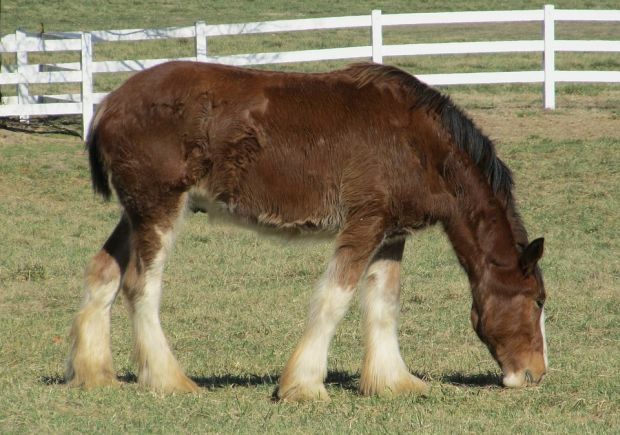 Horses of this breed typically stand about 15 hands tall and weigh approximately 1,000 pounds. They usually weigh about 25 pounds heavier than common horse breeds in the United States. They are fast, really fast, but are also a high-maintenance breed. They are not built for farm work and are not naturally inclined to be a pack horse. 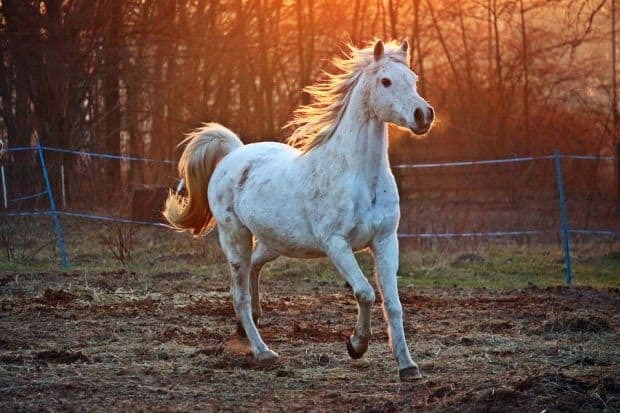 Their speed might make them seem like a logical choice for a bugout vehicle alternative, but Arabian horses tend to get spooked easily if exposed to loud sounds or any new environment their flighty nature convinces them is scary. It would take proper and extensive training to turn most Arabians into a BOV alternative, but if that goal is ultimately accomplished, you will get from point “A” to point “B” in rapid fashion. Morgan horses are quick and agile, and almost rival a Mustang in both beauty and ability. They have been bred for equine sports almost exclusively for the past several decades – they are fast and exceptionally agile. Morgan horses were initially bred for farm work, and with a little training they should be able to return to their roots – while retaining their competition-level speed. A mule bred from any of the top prepping horse breeds should make an excellent pack, cart, and work equine. A Jack – male donkey, breeds with a mare, to create a mule. Mules are always sterile. When crossing a Jenny – a female donkey and a stud horse, you wind up with a “Hinny.” They too make great pack animals, but such breeding is rare. Mules have been known to possess the ability to pack between 150 to 300 pounds through the mountains for up to 20 miles per day. They can pull a cart containing up to 400 pounds of weight all on their own. They have at least as much pack and pulling ability as a horse. Once trained, a mule can pull a plow, cart, or wagon with a team. Mules are also prone to being very territorial and will attempt to defend their territory against invaders on four legs or two. In many instances, horses are far more prone to panicking or being spooked, than horses. Mules must have their hooves trimmed on a regular basis to keep them in good health. A hoof file can be purchased for less than $50 at a farm supply store and with minimal instructions, you can trim the hooves yourself. Like donkeys, mules are never shod. Like mules, donkeys are also stubborn – just not quite so much. The endurance level donkeys possess is quite impressive. Donkeys are very sure-footed, as long as their hooves are kept trimmed. They can walk both up and down steep and rocky terrain without stumbling. For decades donkeys have been packing visitors to the Grand Canyon up and down the natural wonder for many decades. Donkeys can be ridden without any problem, they just are not going to get you anywhere fast. They also very protective of their domain and will bite or kid unwelcomed visitors and appear to thrive on attacking coyotes. 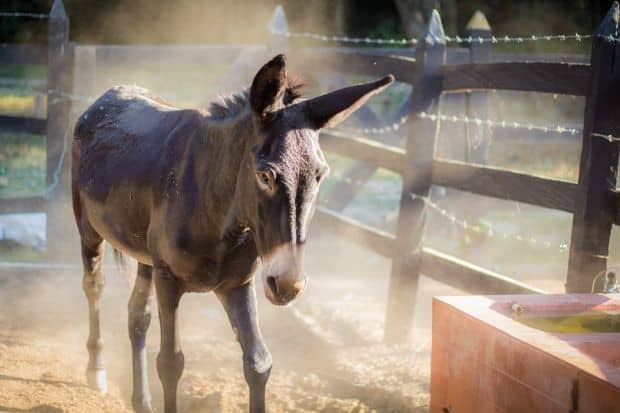 If your donkeys are braying loudly, it is probably time to grab your rifle and go find out what is messing around the barn – either that or you are five minutes late with their feed! 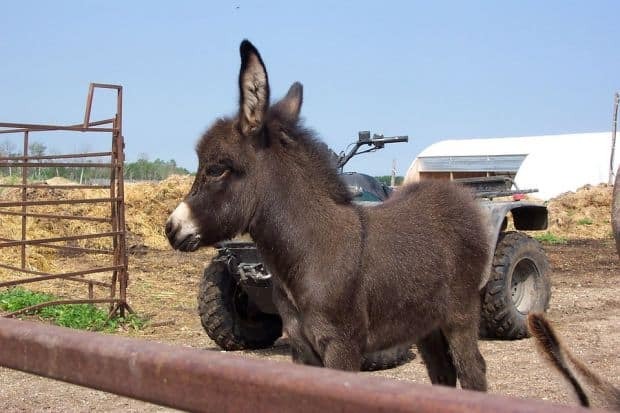 Donkeys, even mini donkeys, can pull carts and haul the weight for extended distances. These little power houses are as adorable as they are useful. 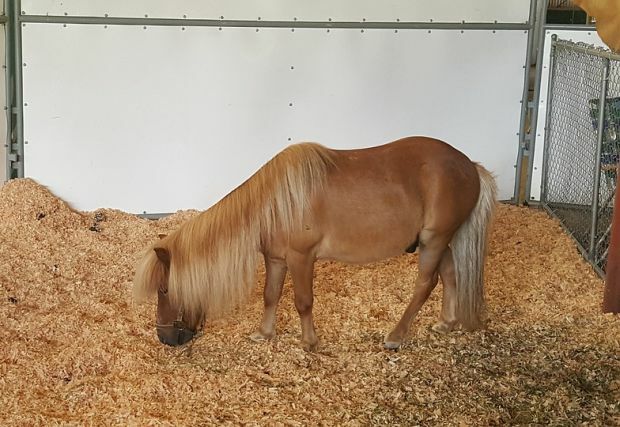 Mini horses can pack about 10 to 15 pounds amounts of weight and pull small carts and light-weight plows with great ease. They are absolutely perfect for a small survival retreat or homestead. 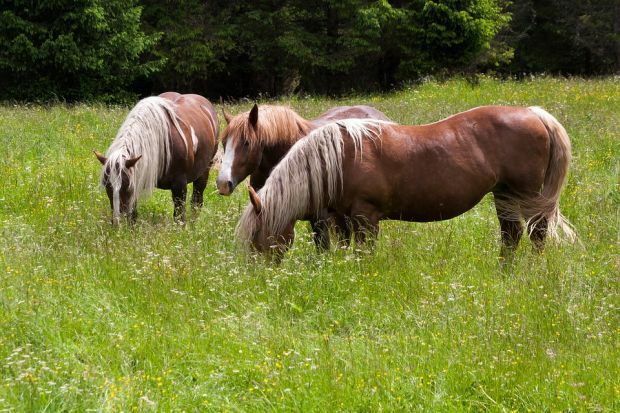 They do not eat even half as much as a standard size horse and therefore do not require much grazing space. Miniature horses are rarely ever shod and can have their hooves filed at home alongside the donkeys and mules in the herd. Although nearly all horse owners supplement the grass and hay their horses, donkeys, and mules eat with commercial sweet mix/all stock feed, it is not necessary. Field corn you can plant yourself is another favorite supplement, but again, not necessary. Equines require only clean drinking at grass or hay to survive. If supplementing grazing with feed either bought in a store or grown yourself, use something oat-based because it aids in equine digestion and/or with corn to help supply the horse with energy and fat. Garnering all of the equipment to harvest and bale your hay for use during the winter months will be a significant expense. The best time to purchase either new or used hay farm implements is in the late fall after pastures have been baled. A bush hog/brush hog attachment to your tractor will work effectively to cut hay. It will needed to be turned – or raked, after allowing it to dry in the sun for three days, before collecting it for feed used. This can be done manually, but investing in a decent second-hand hay rake should be at the top of the prepping with horses supply list. Baling makes the collection of hay simple and you have a firm and easy to carry square bale or large round bale to move with the tractor when you are finished. If purchasing a baler is not in the budget, go the old-fashioned route and thrown the raked hay onto a wagon using pitch forks or by the armload. It takes longer this way, so do not cut too much hay at once and risk losing it to rain before it can be collected. 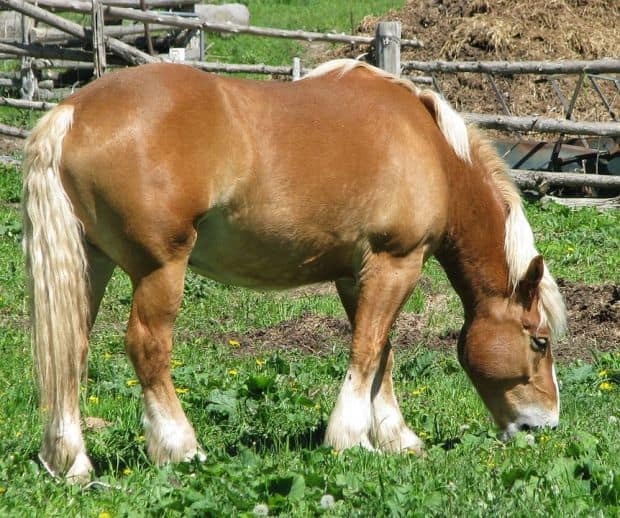 An average size horse, about 1,000 pounds, must consume between 10 to 20 pounds of hay or grass on a daily basis to get the nutrients and calories needed to remain healthy. If the animal is working on the farm or being ridden for perimeter checks, the amount of natural or supplemental feed required increase. If adding a grain feed to the horse’s diet, feed just one scoop, or a half-pound per day. Eating too much feed can cause colic, which is often deadly. Never, ever, no matter how great the deal seems, buy a horse at an auction. Far too often the horses have been drugged before being shown to make them appear docile. Horses that are barn sour – have not been exposed to trials or open fields, will appear to be very receptive to their rider and well-trained. When a barn sour horse is saddled up and taken outdoors, it will frequently be prone to bolting, bucking, and even trying to kick the rider who jumps to the ground as quickly as possible. Inspect the hooves carefully. Learn as much as you can about the look and feel of healthy hooves before going to buy a horse. As the old saying goes, if the horse has four black hooves, buy it, if it has three black hooves, try it, but if it has only one or two black hooves, “pass it on by.” White hooves tend to be prone to softness, may indicate a higher percentage of going lame, and at the very least, chip and crack far more easily – especially during the summer months when standing or walking on dry hard ground. Just like with cars, the price of a horse varies drastically. The amount you should expect to pay will be based on breed, whether or not the equine is purebred or registered – which does not necessarily make it a better ride or healthier than any other horse, age, and location. 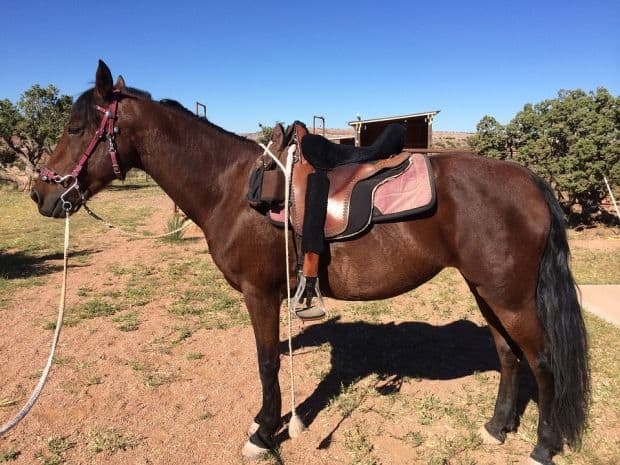 Depending upon the local market, the exact same horse could fetch either a far higher or a significantly lower price a mere 40 miles down the road. In many rural areas, a non-registered horse of good quality can be purchased anywhere from $250 to $700. A registered horse, particularly a draft of a Tennessee Walking horse, will run from $1,000 to $5,000, on average. Check out Fjord horses and American Bashkir Curlies.